A true tour-de-force of the knife as art. Drawing on my years at the jewelry bench, this knife is as much masculine jewelry as it is weapon. But don't let the upscale appearance fool you, though. 10.5 inch flat laminate Damascus blade. Fluted Sterling silver and 18 karat gold handle. All of the 18k bands are scroll engraved.Ten millimeter round Mozambique garnet in pommel. 3.5mm garnets in middle of gold band above the guard. The silver wrap around the ricasso is pierced with the owner's initial. A gold stylized flower is set into the middle of the engraved guard. 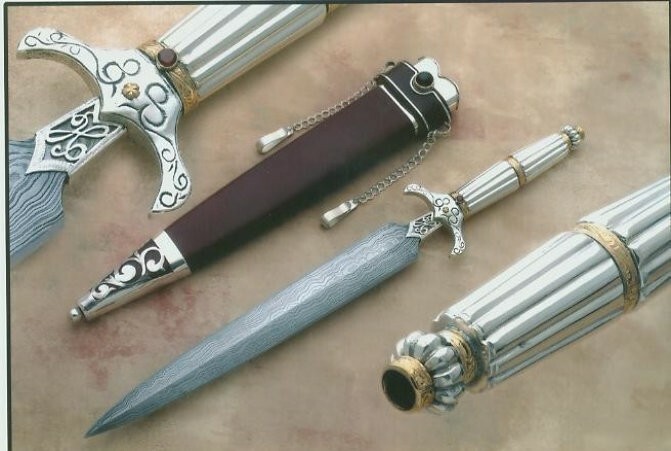 The scabbard is maroon leather over wood with Sterling silver furniture. The frog is set with a 12mm round cabochon garnet, and the tip is pierced out in a scroll pattern.